Something strange is going on at the wax museum. After a number of patrons vanish, the museum director calls upon the famous hero El Santo (referred to as “Samson” in the English dub) for help. Not only will doing so protect him from harm, but the presence of the legendary “Man in the Silver Mask” should hopefully make people feel safe enough to continue visiting. But since this is a horror movie involving a wax museum, it should be obvious to the viewer who is behind the disappearances (and what they are doing with the victims). While admittedly far from perfect, “Santo in the Wax Museum” can be a lot of fun and does offer a few chills along the way. There are plenty of wrestling matches scattered throughout the film and they are never boring. Since this is one of the earlier El Santo films, said matches were filmed in front of a screaming crowd rather than on an empty sound stage. Their enthusiasm is infectious and the ring work shows why Santo was as famous as he was. I have never been able to get into watching professional wrestling, but the film’s high-flying lucha libre action was downright captivating. Sadly our hero’s final battle with the wax monsters was something of a let down. Earlier in the film we get plenty of references to the museum having figures of famous horror characters like Mr. Hyde and Frankenstein’s monster. Given the sheer number of wax figures on display, it seems reasonable to assume El Santo will be battling hordes of monsters come to life. Instead he does battle with a handful of generic monsters, including a pig man! They didn’t even try using the same actors wearing different costumes trick! Oh well, at least we still get Santo kicking the crap out of monsters. Although he is pretty ruthless considering how said monsters used to be innocent people. The reason for the focus on animal-based monsters appears to be due to the writer being inspired by The Island of Lost Souls, right down to the villain wanting to create a panther woman. Speaking of the villain, his motivation is bizarre and not something you would ever see in a modern movie (and for good reason). 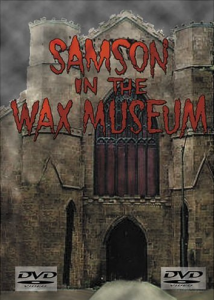 Although released in 1963 as Santo en el museo de cera (which translates as “Santo in the Wax Museum” in English), the film went directly to American television as Samson in the Wax Museum in 1965. Presumably the name change was either an attempt to make the film seem less foreign or because of potential issues involving use of a direct translation of El Santo’s name (“The Saint”) in the title. Despite being labeled “campy” by some critics, it’s interesting how the Santo films apparently weren’t campy enough for distributors to pick up in order to cash in on the Batman craze the following year. Mainstream American audiences also missed out on his adventures during the superhero media boom of the 70’s. Perhaps a talented wrestler in a mask was just too “normal” when compared to the likes of Superman and the Incredible Hulk? Whatever the case was, we missed out big time. America desperately needs more El Santo. The now long defunct Beverly Wilshire Filmworks issued this on DVD back in 2000 as a bargain bin title. As expected, it was the barest of bare bones with only menus and a whopping 4 chapter stops. Thankfully the fullscreen transfer didn’t suffer from any compression issues and looked as decent as an unrestored 16mm print could. But there is one point in the film where the action stops, the screen fills with static and then the film starts right where it left off! There has been speculation this is due to a reel change but I can’t make any definitive statement on the matter. All I can say is how it makes determining the exact running time difficult. Let’s just say it was around 90 minutes of El Santo action. There is actually a restored version of the film on DVD from Lions Gate Entertainment under its original title (and coupled with another El Santo film to boot), but it is only available in its original language. I suspect this is the same transfer which occasionally appears on cable. Hopefully the audio from the dub can be coupled with the restored version for a future home video release.